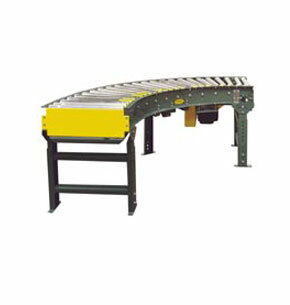 This model is a light duty live roller curve that provides a positive drive for negotiating 90°, 60°, 45°, and 30° turns. It may be self powered or can be slave driven from 138-ACC, LRS or LRSS conveyors. Bed - 6-1/2" deep x 12 ga. formed steel frame powder painted. Rollers - 1-3/8" dia. x 18 ga. galvanized roller (12" to 18" OAW) and 2-1/2" dia. tapered to 1-11/16" dia. x 16 ga. galvanized, and 1.9". dia. x 16 ga. galvanized straight roller (24" OAW). Overall Frame Widths: 12", 15", 18", 24". Motor - 1/2 HP standard. Capacity - 150 lbs. (distributed load).